LogMeIn today announced it is discontinuing its free remote access product, LogMeIn Free. Users will be given seven days to make a purchase decision about LogMeIn Pro; the grace period starts from the point of logging into the LogMeIn service. The company says it has already begun notifying impacted users via email and in-product messages. Central customers are not affected, and neither are other freemium products like join.me and Cubby. That being said, users of LogMeIn Ignition for Android and iOS are also impacted, even though these apps were not free. Those who purchases these products “will receive significant discounts, as well as generous terms to ease the transition” LogMeIn says. Ignition mobile users will be receiving details of these offers this week. We will be unifying our portfolio of free and premium remote access products into a single offering. This product will be a paid-only offering, and it will offer what we believe to be the best premium desktop, cloud and mobile access experience available on the market today. The move is part of a broader decision to gradually migrate users of LogMeIn-branded remote access offerings and Ignition-branded remote access offerings to a single, premium access product. Subscriptions to this new service will include LogMeIn’s signature remote access to two or more computers, premium mobile apps for Android and iOS, as well as native Mac and Windows desktop apps. 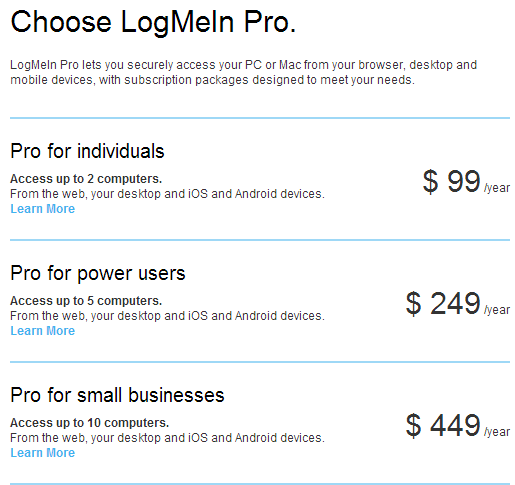 All users who purchase a subscription to LogMeIn Pro will get the new premium remote access experience. LinkedIn promises it will include integration with popular cloud sync and share products like Cubby, Dropbox, Box, Google Drive, and SkyDrive, the ability to manage and transfer cloud and local files, remote printing, and so on. More information about the changes is available in the FAQ.